The 20th century was rough on cavalry. While the age of battlefield dominance by horse-borne fighters had long since passed, scouting and charging from horseback remained a part of warfare, especially irregular warfare; that is until trenches, barbed wire, machine guns and armored vehicles rendered that use for horses mostly irrelevant. Cavalry regiments traded in their mounts for armored vehicles, and for the most part the dream of nimble fast scouts or special forces traveling close to the ground was left to motorcycles, if anything. But what if, instead of a familiar style of vehicle that can run on fuel found most anywhere, there was a new kind of flying machine, specifically targeted at the military? What if it was a jet bike? Thats the bold promise from JetPack Aviation, a startup that launched preorders for recreational versions of a flying personal vehicle in March 2019. Jetpack Aviation has previously made a flying machine, though as the company name suggests, that one is a jetpack. In November 2015, the company released a video of a jetpack flight around Ellis Island. Of the 38 videos on JetPack Aviations YouTube page, the Speeder is featured in just one. The company listed the Ellis Island jetpack as having a top speed of 100 mph, a maximum altitude of 10,000 feet and a total flight time of 10 minutes. With the Speeder, the company has upped the numbers on all categories. With four engines (five in the military version) powered by kerosene or diesel, the Speeder is listed as having a top speed that exceeds 150 mph, a ceiling of more than 15,000 feet and a flight time of 20 minutes. The specifications for the military concept expand the flight time to possibly 30 minutes, and include the option to fly autonomously. The military model, as sketched out, would also be able to use Jet A fuel. Speeders will announce their presence with all the subtlety and volume of an ambulance siren, thanks to a sound profile estimated at 120 decibels while flying at or below 10 feet. On noisy, crowded battlefields, thats less of a concern than for a unit attempting to move discreetly, but it still necessitates the trade-off between using hearing protection and being able to communicate with the rest of the unit. (For one point of comparison, as recently as 2017, the Defense Advanced Research Projects Agency explored a hybrid electric motorcycle for special operations forces that was 75 decibels on fuel, 55 on electric, and was built on an existing motorcycle that retailed at about $15,000). Loud and short flights drastically limit what military roles could be performed by those riding Speeders. Flying 50 miles in 20 minutes is impressive, but less so when the vehicle must refuel at the other end. Its a fun concept, though the utility is somewhat harder to fathom. Autonomous resupply is the far likelier use for a Speeder. The maximum weight capacity of the concept vehicle is 250 pounds, including pilot, so think more super-fast mule than futuristic scouts or Speeder-mounted cavalry. If its underwhelming to remove a military hoverbike from Star Wars-esque pursuit scenes and use it for practical and mundane logistical work, know that its also not unique. Thats the same path followed by Malloy Aeronautics, a company that made a personal transportation prototype aimed it at the commercial market, but then attracted military attention with a fanciful flying motorcycle, only to see it pursued primarily as battlefield resupply. As the Joint Tactical Aerial Resupply Vehicle, the Malloy Aeronautics hoverbike is aimed at autonomously carrying between 300 and 600 pounds at 60 mph with a run time of 90 minutes and an operational range of 70 miles. Battlefield resupply is the use case, second only to medical evacuation, where the quick transport of small payloads is of tremendous importance. 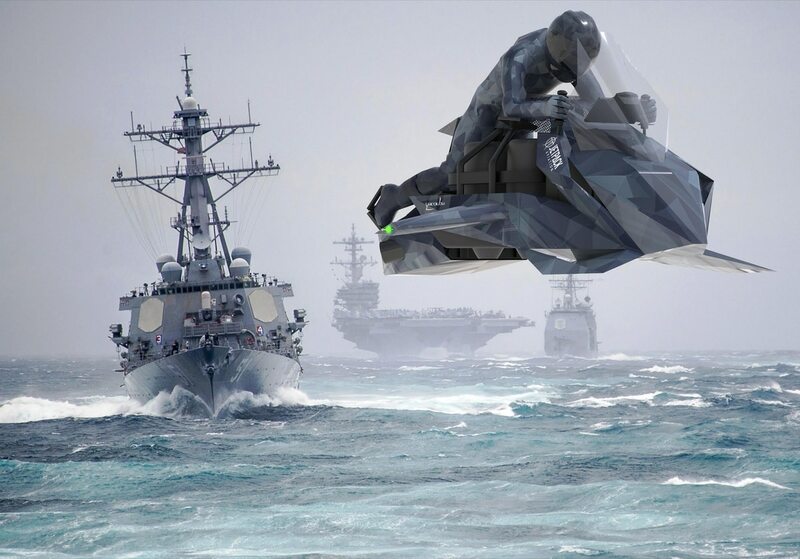 To the extent that military development of the Malloy hoverbike provides a way to get blood, bullets and food to troops otherwise unable to resupply, a Speeder-like jet bike that can do some of the same mission but faster could carve a niche within the niche. The limitation of a 25-mile range for return trips can be offset somewhat by delivery just 10 minutes after launch. A one-way mission to get supplies or a medic to troops 50 miles away, with the understanding that the Speeder will be abandoned and scrapped if it cannot be refueled in place, could be an option commanders like having on hand, though perhaps not ideal at a mid-six-figures price point. For the Speeder to reach that niche within a niche, it will need more than the kind of flashy concept videos that woo Silicon Valley investors. It will take working prototypes, a clear statement of the mission and use case, and a willingness to go through a longer military evaluation process should armed services show interest. There is no amount of speed that can bypass a narrow range of usefulness. Megaforce tried them in the 80s. They need to make sure Chuck Norris is driving it. I think they had these in “The Island”. I thought they were flying at some point, though. Only $380K a pop. Sold-out in no time. .. a top speed of 100 mph, a maximum altitude of 10,000 feet and a total flight time of 10 minutes. hopes it includes a hefty life insurance policy, splints and squeegies. Hmmm, jet bike?...or...new snow blower? No one acknowledges the show even ran. Well, you could shoot them down with WWII AAA with optical sights. No radar or missiles needed. Then there’s the question of range, and how to get out of what you got into. I can only imagine what a bunch of 20 year old new warrant officers would do with this!! a pilot and 2 mounted RPGs and function like a super small A10 in a confined battlefield. I was going to say minigun, but the payload would have to go WAY up to carry the ammo for even a 1 second burst.